Many thanks to Chrys Cymri for providing me with a copy of this book in exchange for an honest review. I was kindly offered this book by the author in exchange for an honest review and my initial impressions were “yeah this sounds like my kinda thing. Here there be dragons” ya know? Only to get more fully immersed in the book and find that I was a touch disappointed. 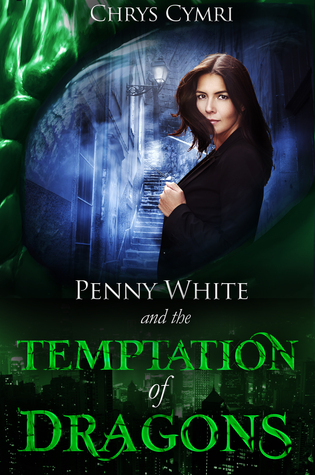 The Temptation of Dragons follows Reverend Penny White as she becomes the Vicar General of an alternate world called Lloegyr – please note that there is a heavy Welsh influence in this book coupled with an enormous religious influence – where dragons, unicorns, gryphons and more reside and coexist in relative peace. The book starts with Penny White coming home slightly intoxicated and thinking she’s going mad when she comes across a dying dragon. In true priestly form Penny gets out of her car and performs the last rites of absolution to what turns out to be a real dragon! From that moment on Penny’s life changes in so many ways – dragons exist, unicorns are real, snail sharks get drunk and gryphons are eating her garden birds. Penny is soon tasked to become the Vicar General to the citizens of Lloegyr and that includes all manner of supernatural beasties. Though expected as the main character is a priest, I didn’t expect there to be such a heavy religious influence all throughout with literal verses from the Bible quoted on a regular. Please understand that this is not anything against the book or against the writer and is merely my thoughts on what I considered an overly religious-toned story set in the wrong time period and the wrong world. I honestly found that the hardest part of reading this book but there were parts that I enjoyed for example: Penny White has what amounts to an obsession with sci-fi/fantasy and occult TV and movies, a lot of which were quite obscure for me (not really a TV and movie person *gasp*) I didn’t get several of the references – particularly the Doctor Who ones. The sarcasm and humour was rife throughout this book which was brilliant and gave it a nice light undertone to the ultimate seriousness of the book as a whole. There was one character I didn’t like and that was her brother James- I’m not 100% sure why but something about him rubbed me the wrong way. He’s a free loading, insensitive toss pot and possibly a pod person. However, despite my dislike of the heavy religious overtone and of James, I really, really liked how Chrys wrote the dragons and unicorns and all the other supernatural creatures and they had enough of a description without giving away too much important information; but also, on the flip side, there were away lot of unanswered questions such as how exactly does a unicorn use a telephone? In all, it was a well written book with an interesting concept and some good characters and prose, dialogue was perfectly modern for Penny and a touch Olde World for a lot of the Lloegyr residents.